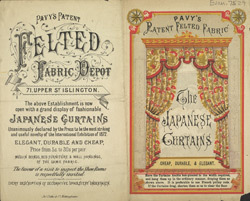 At the beginning of the 19th century, all clothing and home furnishings in Britain were hand stitched. Depots such as Pavey's appeared around the middle of the century. Here, for the first time, standardised curtains, bed linens and wall hangings could be purchased. During the 19th century, English and French ventures in China meant trade with the Far East increased, and it became very fashionable to have Chinese or Japanese style furnishings in the home.